Lemon Cream Cheese Fruit Cookies - What the Forks for Dinner? 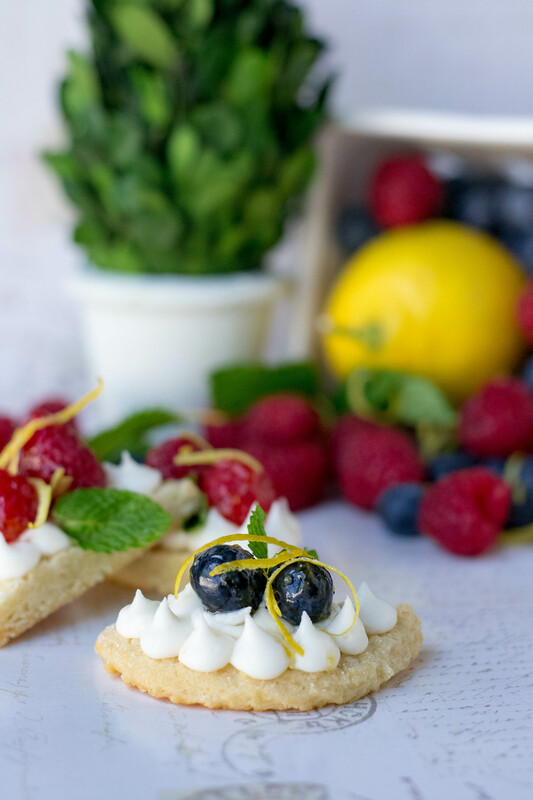 Light and sweet, quick and easy Lemon Cream Cheese Fruit Cookies are your new summer go to cookie/dessert. I’ve made reference to the fact that my brother has a party every year. He calls it a bash……..it’s a family reunion! I’m the family member who everyone tried to guess what I brought. 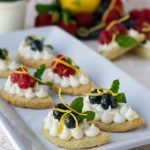 This year I made the Two Ingredient Crust Veggie Pizza….my healthy contribution, and Lemon Cream Cheese Fruit Cookies….my not so healthy, but delicious contribution. When ask what i was bringing……dessert just sorta popped out of my mouth. 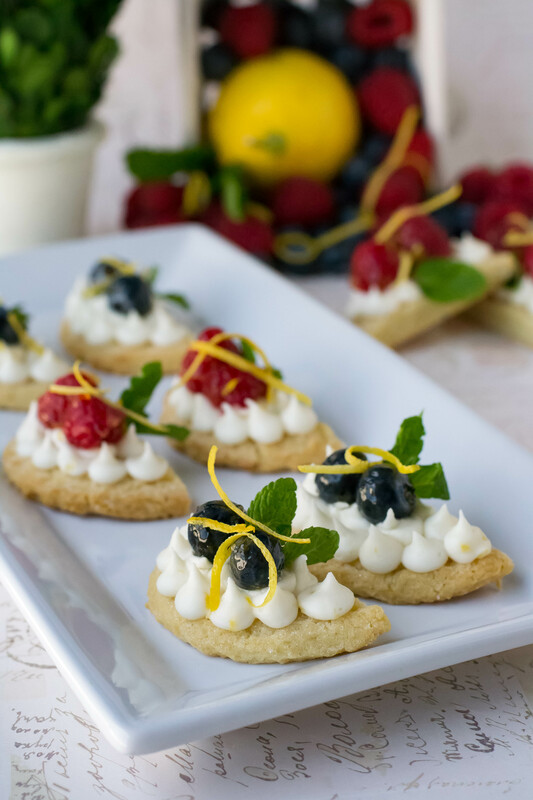 I love dessert…… It’s the whole reason for a meal…….in my humble opinion. Now this past month has been crazy insane busy for me, almost to the point of not enough hours in the day! The culmination of the month was my brother’s party…..and a dessert!!! Yikes!!!! My first thought….. lets keep the pizza theme going and do a fruit pizza. That meant making a crust and cutting all the fruit….blah blah blah…….a big NO!! Unless…..I could make it simple. Fake and bake simple. One of my crazy month things was providing a lunch for 30 women from school for a class we were taking. It was simple sandwiches, chips, and cookies. Given that I was running on empty, I purchased cookies. One of the cookies I purchased was a lemon cookie. At the lunch, that was the cookie I had and it was really quite delicious. With my wandering mind…..yeah I have the, I’m thinking about tomorrow, next week, next month mind……you get my drift!! What if I could use a pre-made cookie for the base of my fruit pizza?? 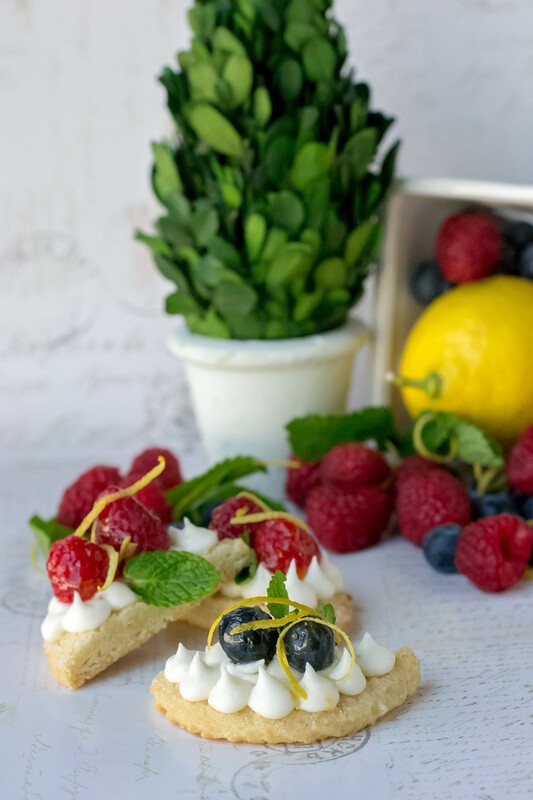 Fruit pizza is usually a sugar cookie base and a touch of lemon (lemon cookies) would be perfect. Cream cheese frosting for a base, with a touch more lemon……a plan was forming. Fruit????? 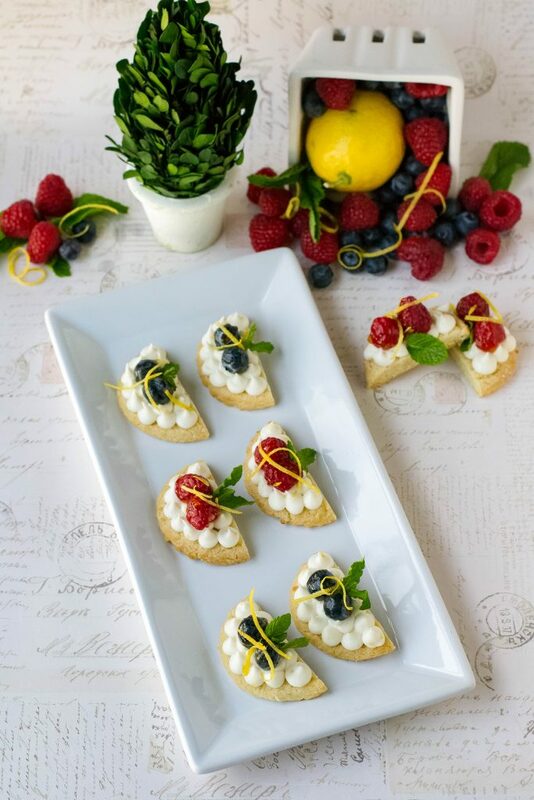 I love raspberries and they seemed a natural with the lemon. So, plan in place, off to the store for more of those lemon cookies…….and NO…they’re out of lemon cookies. But…..the party is tomorrow and I want to prepare ahead….now what???? Soft sugar cookie?? OK and ramp up the lemon. Take a breath …….it would all be fine. With alternate cookies and the rest of the items on the list, I was on my way. Originally I was going to do a whole cookie, but it seemed like too much, Tim suggested that I cut the cookies in half and just put two pieces of fruit on each cookie. Half a cookie, lemon cream cheese frosting piped in a decorative manner. Glaze your fruit with some melted apricot preserves (be sure to strain them so you don’t get clumps of apricot), it gives them a shiny appearance without changing the flavor. Just two berries was enough. 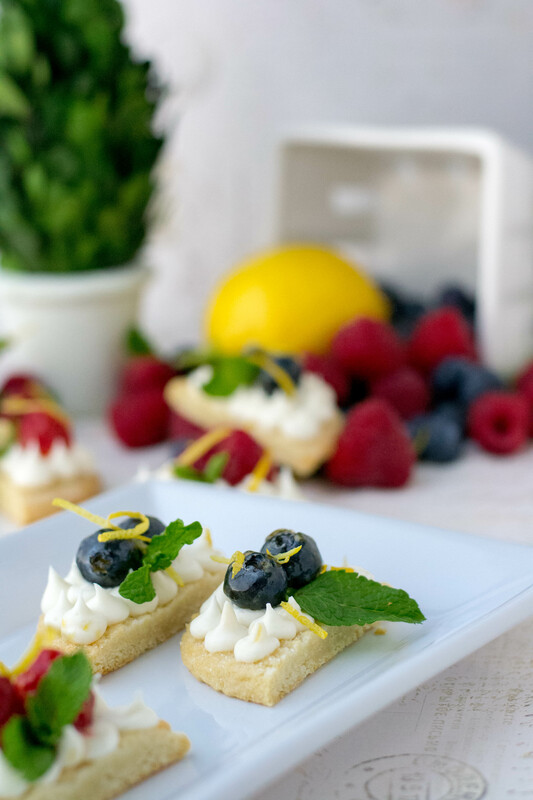 A garnish of lemon peel and a sprig of mint makes these extra pretty. Making a second batch for this post, I also used blueberries. Any fruit will do as long as it isn’t too big for the cookie. I must admit these turned out wayyyyy better than I anticipated. And they were a huge hit at the party. I had several request for the recipe, which at that point was only in my head. Posting this recipe was going to be later this month, but I had a special request from my cousin Anne, so I pushed it forward. Anne works at Lincoln Way Inn, a bed and breakfast in Franklin Grove, IL and she thought their guests would enjoy these cookies. I hope they do. 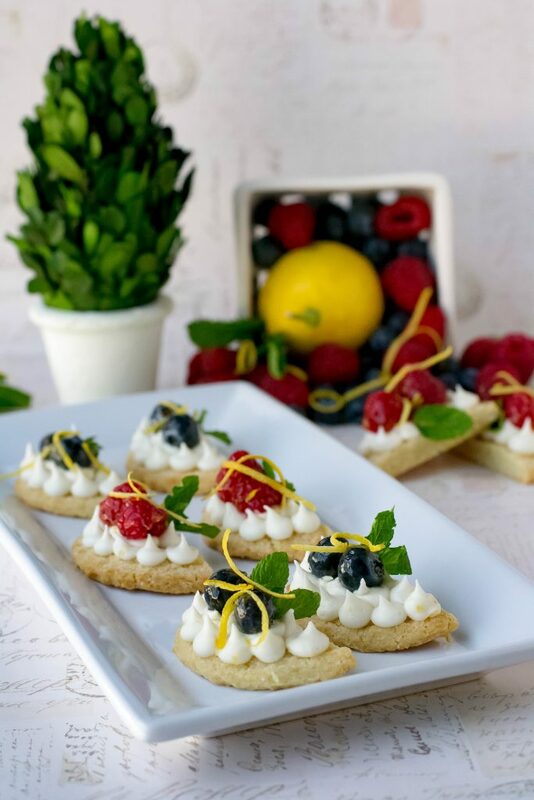 If you are in need of a quick, easy, light and sweet dessert for your next get together… try our Lemon Cream Cheese Fruit Cookies. Beat cream cheese, butter, lemon juice, lemon rind, and vanilla together until smooth and fluffy. Add powdered sugar and beat until creamy. Add more powdered sugar if frosting is not firm enough to pipe, you want a thick frosting. Place sugar cookie halves on a baking sheet lined with parchment paper. Place cream cheese frosting in a piping bag fitted with a round tip (I used a #9 Wilton tip). Cover each cookie piping circles to cover. Melt preserves in a small sauce pan. Strain preserves to get rid of any clumps of fruit. Allow to cool slightly. Rinse and pat dry the raspberries and place in a medium bowl. Pour melted strained preserves over raspberries, and mix lightly, trying to keep the berries in tact. Place two of the glazed berries on top of each frosted cookie half. 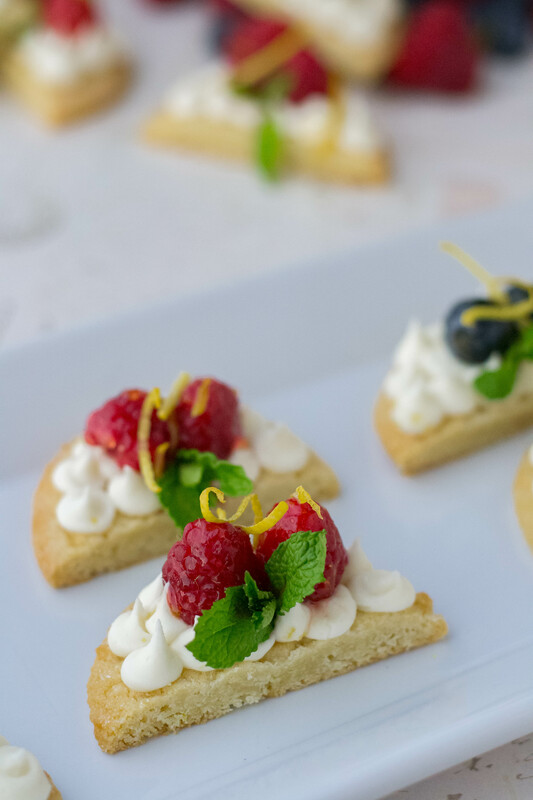 Garnish with lemon zest and mint leaves if desired.